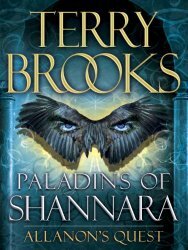 I finished Paladins of Shannara: Allanon’s Quest by Terry Brooks last week. I almost forgot to add it to my list. :) It’s another short story, but as I said before, I’m counting them for my reading challenge. It’s been hard to get into a novel these last few weeks because I have so much writing I need to do and I don’t want to get invested. I used to think I read fast, but I’ve had to face the fact that I actually don’t. I just used to spend so much of my time reading! There’s a difference there that’s hard to ignore when you don’t have so much time to spend. It takes me anywhere from 4 to 8 hours to read a book, depending on complexity and how into the story I get. As my interest peaks, I actually think I read slower. It’s been about 25 years since I read The Sword of Shannara and its sequels, and I’ve been meaning to catch up with the series and finish it off but I’ve just never done it. Oh, and this short story was good. Read it if you like short fantasy fiction.